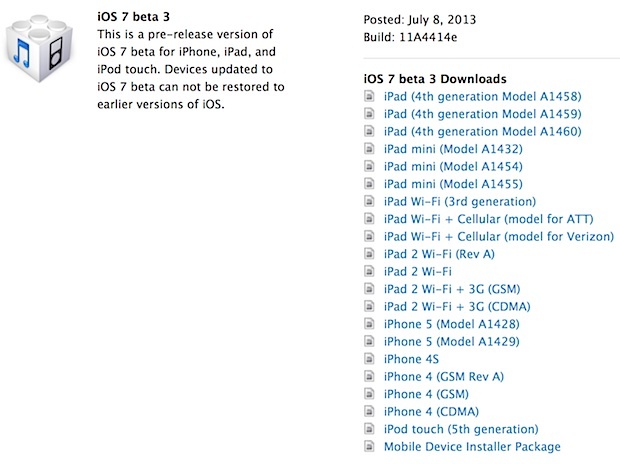 The third beta of iOS 7 has been released by Apple for supported iPhone, iPad, and iPod touch models. The beta arrives as build 11A4414e and is expected to include many bug fixes and improvements, as it further pushes iOS 7 to it’s anticipated public release later this year. Tapping “Download and Install” begins the update process. OTA update remains the easiest way to get the latest beta versions of iOS 7, as the update arrives in delta format making it a smaller download that is then installed directly on the device. Installing through Software Update can sometimes hang for a while on the “Preparing Update…” stage, so don’t be surprised if it takes much longer to prepare the update than it does to download. The iPhone, iPad, or iPod touch will reboot itself when the update is completed. 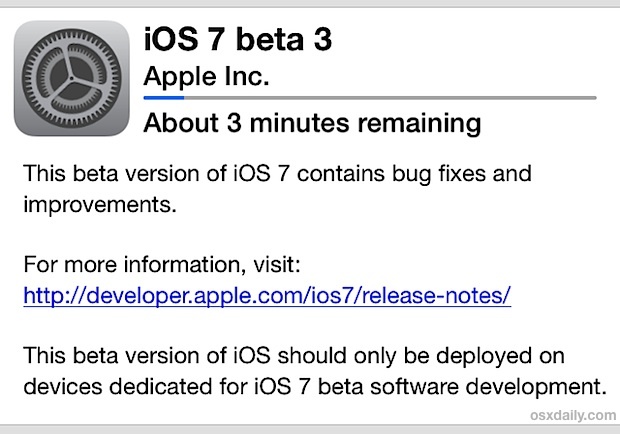 iOS 7 beta software is intended for use on developer devices and not for everyday usage. Nonetheless, if you wish to experiment with the beta, it remains very simple to downgrade from the beta back to stable iOS 6 builds in the event it’s needed. Alongside the iOS 7b3 is a new development release of Xcode 5, versioned as Developer Preview 3, which is also accessible from Apple’s developer portal. An update to OS X Mavericks is expected to arrive shortly.